AVO Model 40 s/n 417599-1146 working Given to me by David Bone. The model 40 which has a 3 mA movement is housed in an aluminium case. 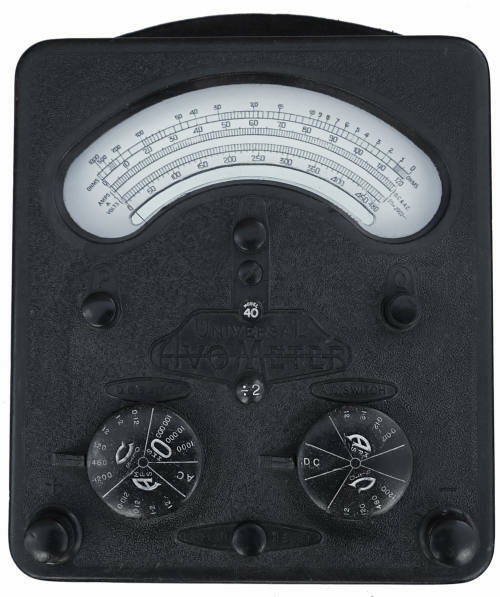 This general purpose model introduced in 1940 is an updated version of the original AVO meter and preceded the the more sensitive model 7 which was renowned for its reliability and robustness, the incorporation of a mechanically operated cut out linked to the meter movement. The two switch range selection system have endeared the latter to generations of radio and television engineers. 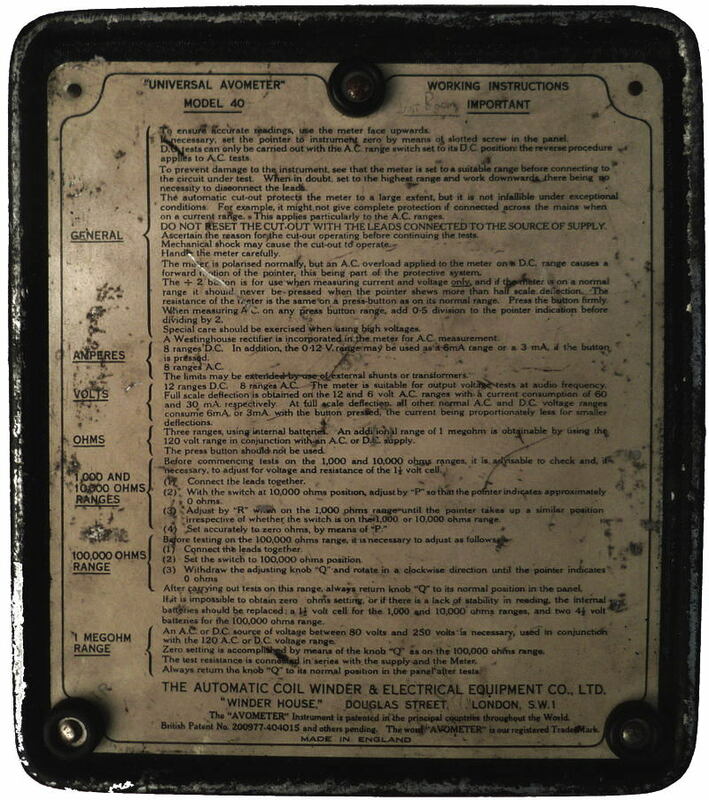 Indeed many service manuals for radios include voltage values based on the model 7. I have been [April 2013] given a model 8 Mk4 and a model 40 by David Bone, both were filthy and had several faults when I received them. Both had resided uncared for gathering dust in a garage for many years. The model 8 was missing a reset button and one of the high voltage terminal and was soon cleaned and back in working order. It did have a surprise, there was a VC1 voltage converter in the battery compartment. The model 40 described here was another kettle of fish. The glass appeared to have been replaced at some time and a number of repairs had been made over the years. Dates pencilled on the back of the meter scale bear witness to this as did fragments of glass in the case. 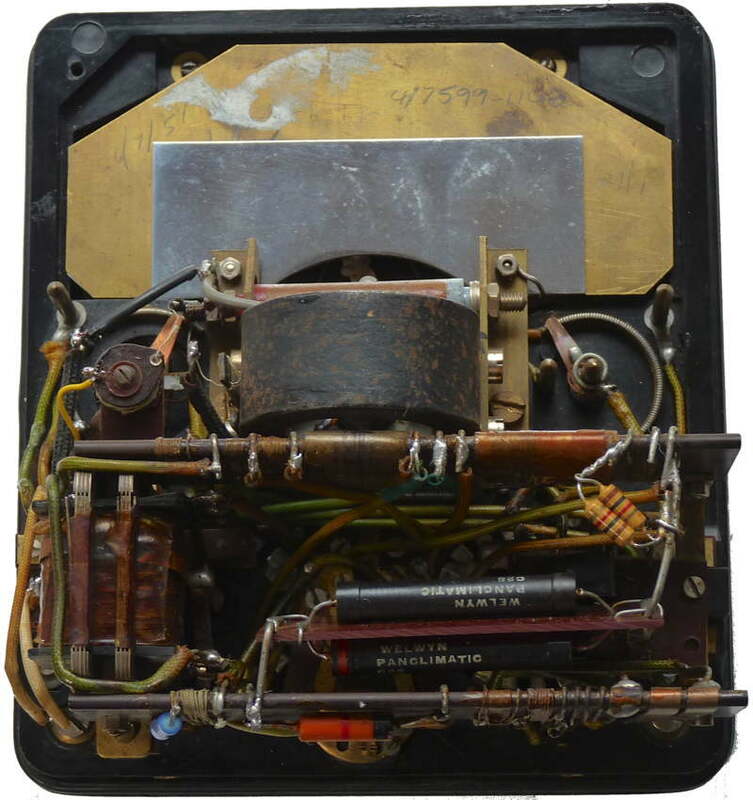 A label on the side indicated that it had been calibrated in 1975. The Q resistance adjustment knob was broken and the battery cover was missing. The corroded and leaking 1.5 volt cell had to be drilled out of the battery compartment [two holes and long nosed pliers]. After washing and drying the outside and gently easing the meter from its aluminium case I found that the meter movement was OK but a poorly soldered connection had come adrift. 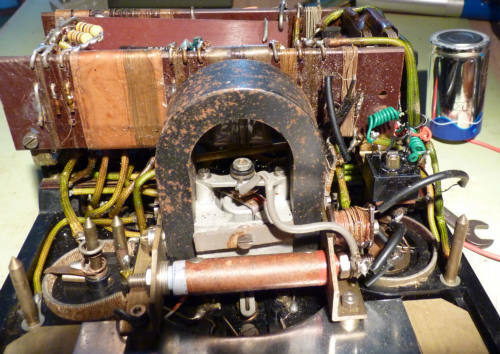 Several of the original resistors had been haphazardly replaced and the contents of the leaking 1.5 volt cell had seeped through to the interior and corroded two of the copper contact springs. Nevertheless the instrument looked salvageable, it was a model that I did not have. and would bring my total number of AVOmeters to seven. When I next came to work on it a few days later, my heart sank, the scale had cracked up and peeled away from the brass backplate (see the pictures below). The most remarkable thing was that the brass had a perfect replica of the scale markings beneath the paint. It was a long shot, but I posted a request on the http://www.vintage-radio.net/forum and Phil Harris kindly sent me a scan of scale from a model 47A meter which I modified and printed out at 300 dpi. I use an iMac so imported the jpeg file that he sent me into Graphic Converter, reduced the saturation, improved the white balance, added a little sharpening and printed out a fast draft copy. From this I calculated the appropriate reduction in size to fit my brass scale plate. Another fast draft copy to double check, then the process of altering the scan to include the still legible serial number and part number from my instrument. I then printed out a single A4 page with three of the final images on 'extra white' 90 gsm paper. Cutting the curved opening for the mirror with a scalpel was the most difficult part. The scale was then glued using a 'Pritt Stick' to the brass backplate. A response from PM Munro to my plight advised that early models such as this were hand calibrated and 12 cardinal points were marked on the scale plate with punch marks and the marks between were made with a proportional pantograph. I was pleased to find 24 of these these indentations on the brass plate when all the paint had been removed. I have a theory about the flaking. 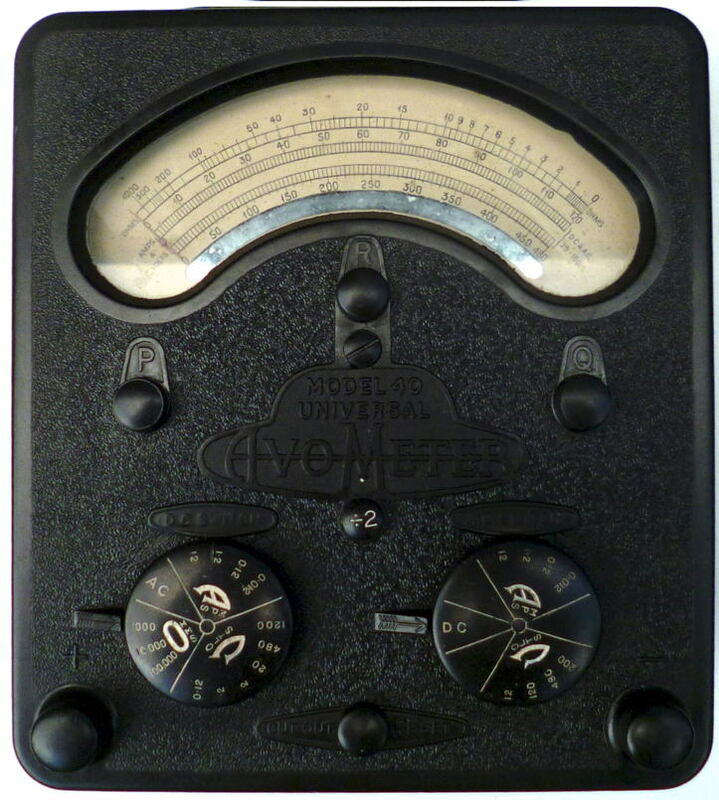 I know from its condition and from the previous owner that the meter has been poorly stored and in a dusty and possibly damp atmosphere. In bright sunlight the black lettering would get hotter than the white background and a combination of moisture and warmth would leach out something in the paint which attacked the brass. The effect would be enhanced in the hotter areas. The back of the paint flakes is light green with no indentations or marks corresponding to the lettering. Having re-assembled the meter I turned my attention to the broken 'Q' knob. I discovered that by undoing the nuts that hold the wiper in place the brass rod and broken pieces of bakelite knob could be removed. I found a small 6BA bakelite terminal which was the same diameter as the broken one (though a little deeper) and drilled the brass spindle to take a 6BA screw which I soldered in place to attach the terminal. A small piece of black plastic tube was used to make up the diameter. You can hardly notice the difference in the photograph. The lettering was touched up with off white emulsion paint applied with a very fine water colour brush and allowed to dry for a very short time before being wiped away with a soft cloth. The front panel was cleaned using detergent and a tooth brush and finally given a spray with furniture polish. I tested the meter on several ranges and found that it reads between 1% and 2% high depending upon the deflection, but that is understandable with a foreign scale. I was pleased with the result and decided to accept the shortcomings. I wired in a press stud connector to enable the 9 volt supply to be provided by a PP3 battery and two wires for connection to a 1.5 volt cell. A piece of aluminium was cut and drilled using a battery cover from one of my other meters as a template to complete the job. Batteries The model 40 used a rectangular 1.5 volt cell with a brass terminal and a flying lead for the negative connection. 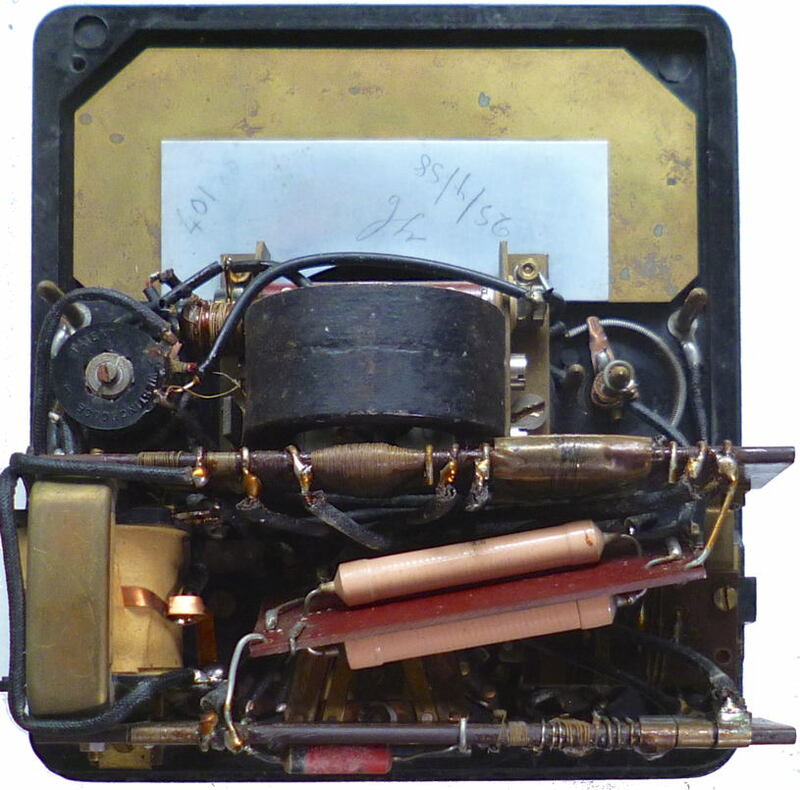 For the highest resistance range two 4.5 volt cycle lamp batteries with brass spring connectors were used. As a replacement for the latter I have wired in a lead with a push fit connector to suit the more commonly available and cheaper 9 volt PP3 battery.The 1.5 volt cell was replaced with a single cell size D to which I soldered connections. How old is it? 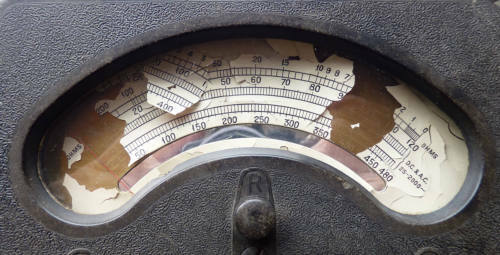 Most AVO meters can be dated from the last 3 or 4 digits of the serial number under the right hand end of the scale. These define the month and year of manufacture. For example this one was made in November 1946. What is it worth? This one was a gift, so not much! The model 8 being more sensitive is probably a better investment, you should be able to buy a model 8 MkII for � 10- 20 which you will find equally as good as the later models. What is the difference between this model and a MK2? The Mk2 has two additional resistors and terminals to measure power factor (with an additional unit) but is otherwise electrically the same. Later models were equipped with the familiar red and black terminals and updated interior construction. The meter movement in the later model has Alnico block magnets rather then the horse shoe shaped one shown here.